J.A. 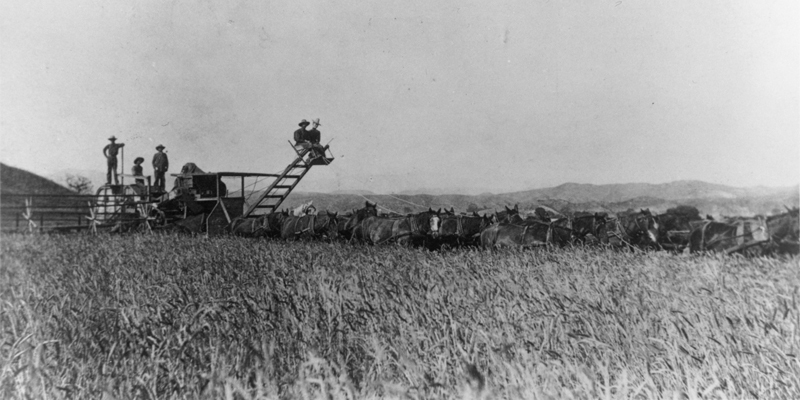 "Jake" Swall family uses what appears to be an 18-mule team to harvest wheat on the Newhall Ranch (aka Rancho San Francisco) west of the town of Newhall  in other words, in modern-day western Newhall and southern Valencia. Identification by historian Arthur B. Perkins in "History of Eternal Valley," 1958. J.A. 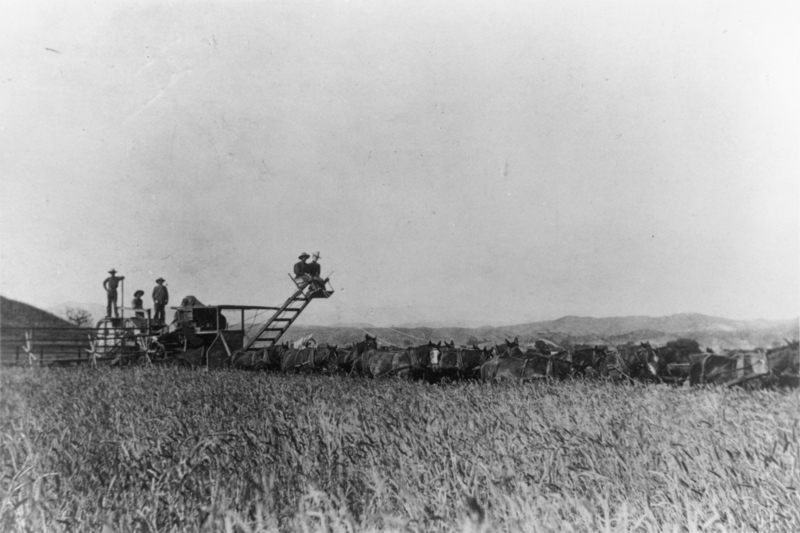 "Jake" Swall Sr. and his three boys — Albert, Henry and Jake Jr. — harvested wheat in the western Santa Clarita Valley in the 1890s. According to historian Arthur B. Perkins, the Swall family leased land that "ran from Newhall Ave. westerly to the Pico foothills." The Newhall Land and Farming Co. was the landowner; we know from Rolle's examination of company records that at the time, Newhall Land leased its farmland to tenant farmers, rather than farming the land with its own staff. Of the bunch, Albert C. Swall left the biggest mark on the community in 1914 when he established a hotel at the southwest corner of Market and Spruce streets. According to Perkins, Albert had left the family harvesting business in 1904 to establish a meat market on Newhall's main street, which was today's Railroad Avenue. "Two years later he joined his cousin in operating the old General Merchandise store," Perkins writes (we don't know what "cousin" Perkins means). Then in 1914, "through the maneuvers of Swall, Ed Pardee, T.M. Frew and other owners of property in Newhall," Perkins writes, "the State Highway was re-routed down a back street." That "back street" was Spruce Street, one block to the west of Railroad. Albert Swall quickly set up a hotel at the corner of Market and Spruce, and most of Newhall's merchants followed his lead. Today we know Spruce Street as Main Street. "By 1920," Perkins writes," the old Newhall townsite [at Railroad Avenue] was dead, and on the new highway the Swall-inspired community — dependent upon traffic for its existence — was beginning." J.A. Swall Sr. is buried in the Pioneer Cemetery section of Eternal Valley Memorial Park. "The Pico Ghost Camp," 1962. Rolle, Andrew, Henry Mayo Newhall and His Times: A California Legacy, Huntington Library, 1991. Renolds ("Santa Clarita: Valley of the Golden Dream," 1992) tells us Albert C. Swall arrived in Newhall from Tracy, Calif., in 1890 at age 19. "History of Eternal Valley From 1769" by A.B. Perkins, Eternal Valley Memorial Park, 1958.